Established in 2007, Transit Support Services Limited has been behind the success of notable transport operators in the whole of West Africa sub-region and continuously researches for best solutions to enhance cost efficient services in transport and logistics operations. The company selects and offers to its numerous customers in the transport industry, the latest solution for efficient Fleet Operation in the area of Safe Haulage Handling and Tyre Sales and Services. 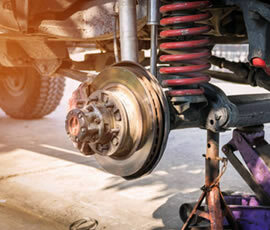 We parade a team of professionals dedicated to using the latest materials to render first class technological services to the Automobile Industry in conjunction with her associates overseas. YANGZOU YAXING MOTOR COACH CO. LTD China - manufacturers of ASIASTAR Bus. SHAANXI HEAVY DUTY AUTOMOBILE IMPORT AND EXPORT CO., LIMITED of CHINA - Manufacturers of SHACMAN Heavy and Medium Duty Trucks and Road Tractors. 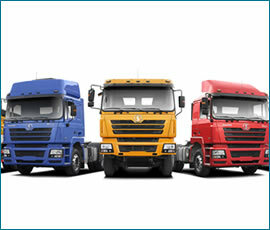 CHANGSHA FOTON VEHICLE TECHNOLOGY CO. LTD - Manufacturers of FORLAND Medium and Light Duty Trucks. BEIJIN AUTOMOBILE WORKS CO. LTD - A Subsidiary of the BAIC Group, and manufacturers of BAW Pilot Mini Buses, Vans and Ambulances. 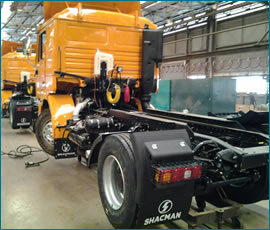 In addition to our strategic manufacturing agreement with the Anambra Motor Manufacturing Company [ANAMMCO] for extreme large orders of Shacman Trucks and Road Tractors, we assemble all these brands at our assembly plant situated in Emene - Enugu. BAW Pilot Mini Buses and Vans. ASIASTAR, China; Pioneer of the coach-manufacturing industry in China. SHAANXI HEAVY DUTY AUTOMOBILE IMPORT AND EXPORT CO., LIMITED of CHINA; manufacturers of SHACMAN Heavy Duty Trucks and Road Tractors. 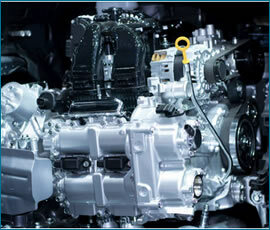 CHANGSHA FOTON VEHICLE TECHNOLOGY CO. LTD; manufacturers of FORLAND Medium and Light Duty Trucks. BEIJIN AUTOMOBILE WORKS CO. LTD; A Subsidiary of the BAIC Group, and manufacturers of BAW Pilot Mini Buses, Vans and Ambulances. Stanley is a graduate of Mechanical Engineering from the Federal University of Technology Minna. He began his career in Peugeot Automobile Nigeria Ltd as a Fleet Sales Coordinator after which he moved to Mercedes-Benz ANAMMCO Ltd as the Head, Truck Sales in Lagos. He later moved to C & I Motors (Franchise holder for Suzuki in Nigeria) as the Sales & Marketing Manager. He had a stint in MB Atfreecal Ltd.
Dave Chukwudulue is a Marketing and Management professional with vast experience in managing both government and private sector clients. He is skilled in distribution channels management, competitor analysis, direct and tactical sales. He is also a Production Management professional, overseeing the assembly of two truck brands: Shacman and Forland and BAW Pilot brand of mini bus and van at the Transit support Services' Assembly Plants at Enugu. He is an agent of change management, applying learned knowledge and practical experience to evolve better work solutions to impact positively on the lives of people, and processes of organizations. His experience spans across facets of services including; CAMAC International Corporation, Labour City Transport Services Limited, C&I Leasing Plc, Citylink Marine Limited, and Associated Bus Company Plc. He joined Transit Support Services Limited in 2016 as Customer Relationship manager. He is a major contributor in the area of Transport and Logistics with over 18 years experience. He is a graduate of Ogun State University, Ago-Iwoye, Ogun State. He obtained B. Sc Degree in Geography and Regional Planning, a Masters Degree in Environmental Management from University of Lagos. Alhaji Kazeem also has his Masters of Science Degree in Transport Studies (M.Sc.) from Olabisi Onabanjo University. Kazeem is a Chartered Member, Institute of Logistics and Transport. Mr. Udoh, Innocent has been in the Auto Industry for about 20 years, and has undergone various trainings in Automobile Production and Services, locally and overseas. He holds the DaimlerChrysler Mercedes-Benz Actros Certificate (Germany) and a Diploma in Mechatronics Engineering Technology. Before he joined Transit Support Services Limited in 2016, he worked in various positions in the Production Department of Mercedes-Benz ANAMMCO Limited for over 14 years before moving on to SCOA Nigeria Plc Production Department, as a Senior Staff (Superintendent). Phebian Iwalokun has been in the automobile industry for over 20 years and holds B.Sc. Degree in Zoloogy from University of Jos, Plateau State. Prior to joining Transit Support Services Limited as After Sales Manager on April 1st 2017, she worked in several world – class organizations including Conceito Motors, Bonel Commodities, Associated Bus Company Plc and SCOA Plc.